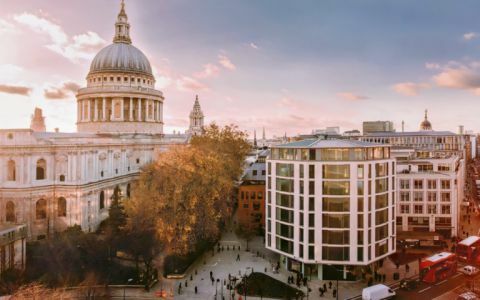 Grade A contemporary serviced offices with floor to ceiling glazing overlooking St Paul’s Cathedral and London’s skyline with 360 degree views. Located on a unique island site on Cheapside, these unbranded offices offer modern facilities with the very highest specification IT & telecoms including building-wide Wi-Fi. There are four meeting rooms, video conferencing, free local & national telephone calls and a customer breakout lounge. Kitchen facilities with light refreshments are available, along with bicycle storage, showers, lifts and a professionally staffed reception. The building occupies a unique island site on Cheapside adjacent to St Paul’s tube station and benefits from stunning 360 degree views over the city. These offices in Cheapside offer a range of prices depending upon your exact requirements. Contact us now and we will help find the best price for you, based on your individual needs. Easy Offices Where is the nearest place to get lunch near Cheapside? Easy Offices Where is the nearest public gym to Cheapside? Easy Offices Where is the nearest car park to Cheapside? Easy Offices Where is the nearest coffee shop to Cheapside?